My father, Nelson William Stearns was born in Sutton, New Hampshire. 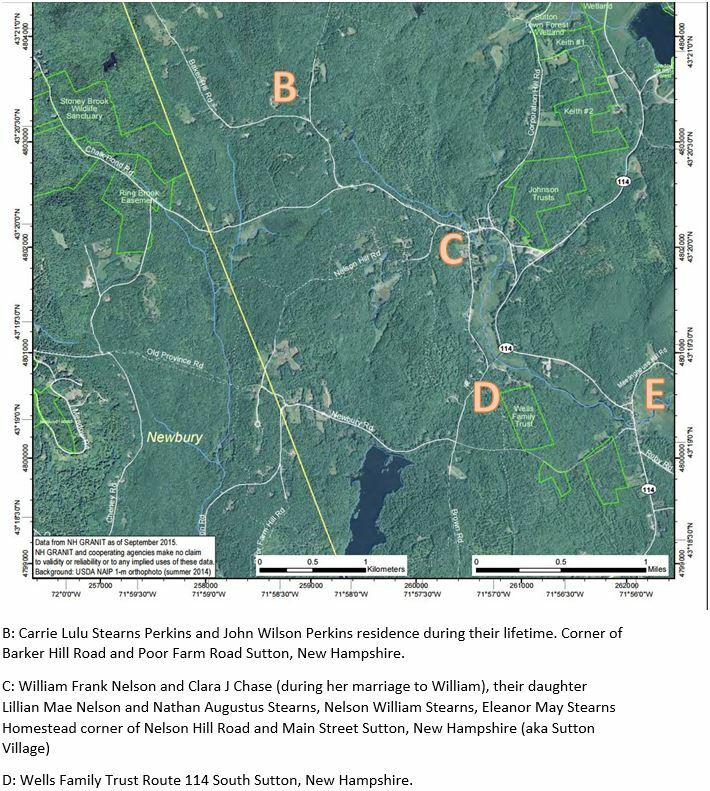 His maternal lineage can be trace back to the early founding years of Perrystown (1767), aka, Sutton New Hampshire. 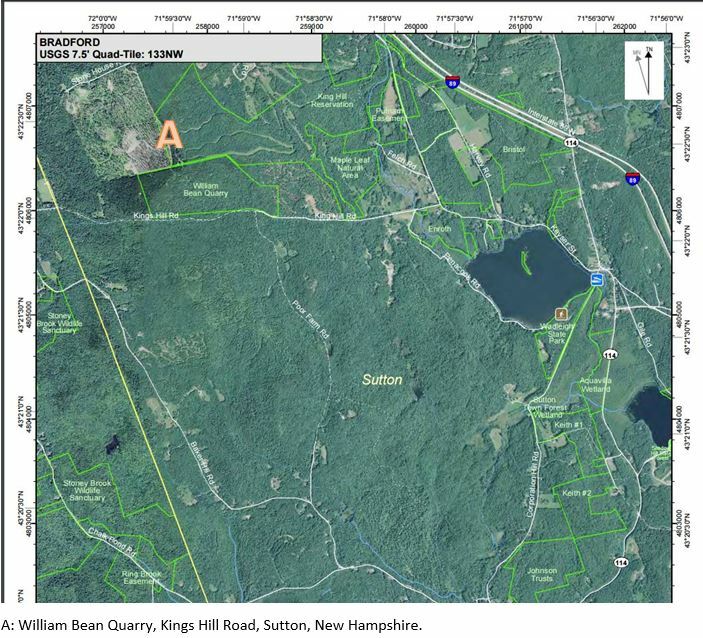 A: William Bean Quarry, Kings Hill Road, Sutton, New Hampshire. B: Carrie Lulu Stearns Perkins and John Wilson Perkins residence during their lifetime. Corner of Barker Hill Road and Poor Farm Road Sutton, New Hampshire. D: Wells Family Trust Route 114 South Sutton, New Hampshire. E: First Meeting House and Cemetery, Sutton, New Hampshire. Earliest Burial ground in Sutton. 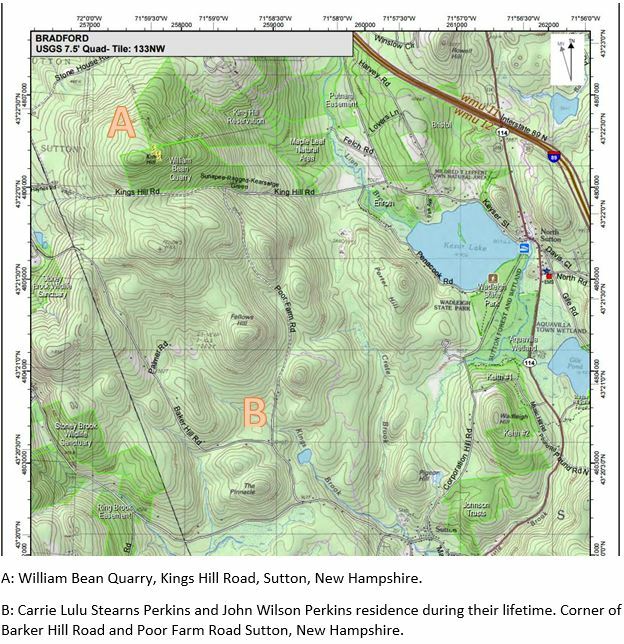 I highlighted areas that relate to my direct line ancestors on the State of New Hampshire Wildlife Management maps . These are not the typical maps people look at for clues. These maps give clues to Trusts, reserves, topographical terrain and road names. When an ancestor is a founding or early family, or have resided in one place most of their lives, looking out of the box is a great place to start when researching for records. Land type, Map#2- Many hills, rocky areas and waterways give a clue to what hardship they overcame. State of New Hampshire Wildlife Management Maps and pages provides hints to what wildlife was available in the area. Knowing location of residence confirms you have the correct family for your tree, how close or far they live to other family members and what distance they had to travel to meetings and worship. A family trust tells me that I need to search town, county, state and probate records to find clues to family, relationships, wealth and possible other lands owned. A Quarry tells you that at least one generation, were stone masons or miners. Need to see who else may have the same occupation. Was it a number of family members or just one family unit? Place of church records including births, baptisms, deaths, burials and town meeting records. Land type may give a clue of what type of occupations were available, fishing, mining, milling, in more recent years skiing, hospitably, resort management or many other possibilities. I knew cousins line occupations; mechanics, junk yard, maple syrup, moonshine, farming, traveling deacons. Just to mention a few. Check out your state’s Wildlife Management, Fish and Game or Land management for maps and clue information to how your ancestors and relatives lived. Think out of the box, you may be pleasantly surprised at what you find. I was. That will be a later post to look forward to. Previous Post De-cluttering = Disencumbering Your E-mails, too!